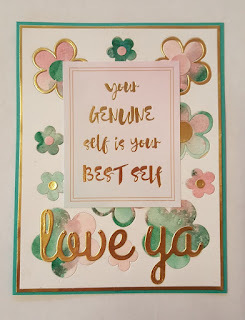 I'm so excited to be participating in my first CAS-ual Fridays New Release! CAS-ual Fridays is and awesome stamp company with a line of got to have stamps. My ever growing inventory of these stamps can attest to this. CAS-ual Fridays is releasing the Girlfriend line of stamps that made their debut in the first SOA (Stamp Of Approval) Box. I had so much fun with this collection. I started my card with the Curtis Background. I knew when I saw this background that I wanted to do a resist technique and I thought how gorgeous black would look. I stamped black ink on watercolor paper using my MISTI then I put Versa Mark on a blender pad and dabbed it on the stamp ( didn't want to contaminate my Versa Mark pad). I used WOW Clear EP and heat set it. I taped this down around the edges and spritzed it with water. I dropped Tim Holtz Squeezed Lemonade and Mermaid Lagoon Ink Refreshers on to the watercolor paper and spritzed them with water. After letting them sit for a while I laid a paper towel down to absorb the extra. 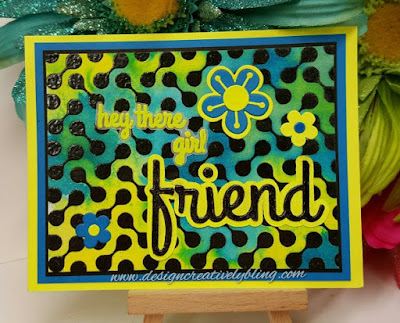 I cut the Friend Fri-die out of black card stock then adhered it to a piece of bright yellow, mounted it on my ScanNCut mat and cut it out with an offset. I ran into a dilemma as to how to put the rest of my sentiment on my card (I couldn't heat emboss it directly since the background already was) and after leaving it sit for the night I decided to heat emboss it with Zing Cricket EP on vellum and fussy cut it. After all this it still needed something so I die cut some flowers using Friendly Flowers Fri-dies and adhered them. 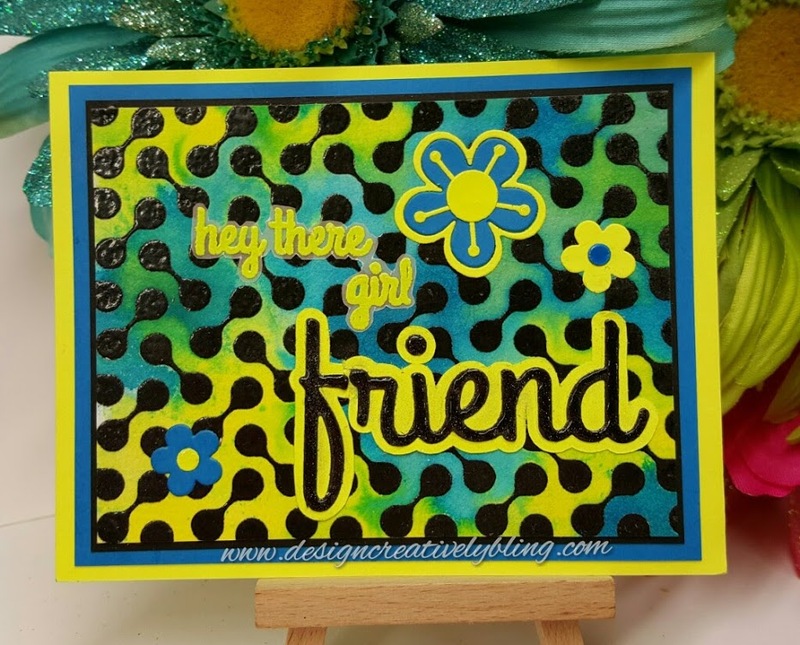 I mounted my finished card front on black then Tropical Lagoon, and Bright Yellow. This card transitioned many times as I made it. I had cut out flowers using CAS-ual Fridays Friendly Flowers from printed paper and was water coloring a background with Tim Holtz Distress Ink colors Evergreen Bough, Spun Sugar and Worn Lipstick. I started cutting out the flowers from this piece with the intention of inlaying the printed paper, but the Water color flowers I was cutting out to discard looked so pretty that I decided to inlay them in white card stock. I attached a piece of Stick It to the back of a piece of Neenah Solar White 80 lb that I had die cut places to inlay these flowers. 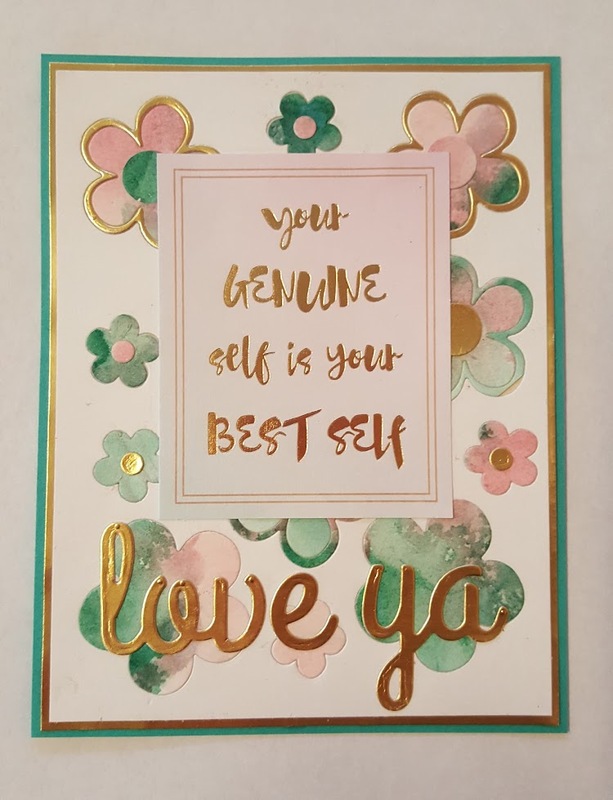 I also die cut some flowers and CAS-ual Fridays Love Ya in MFT gold shine card stock . 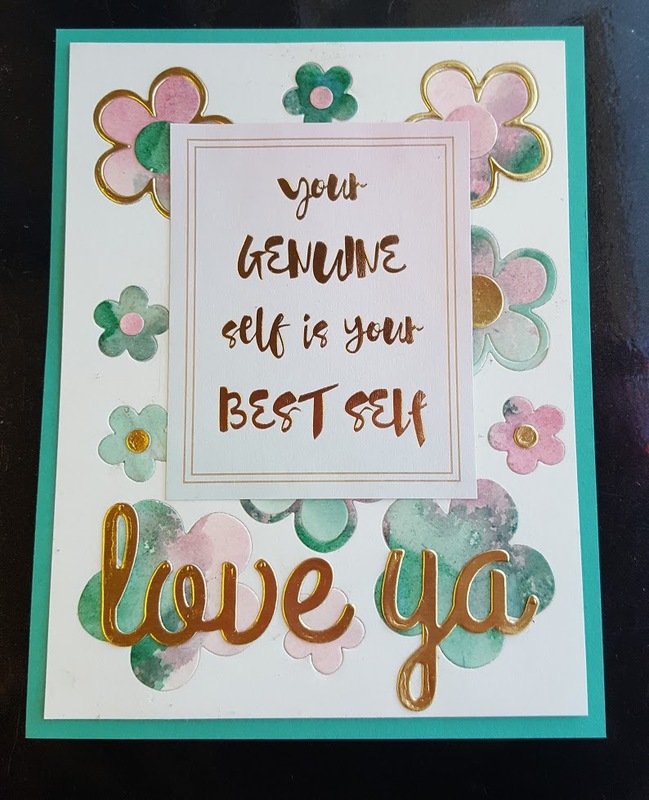 The sentiment piece is from a 12 x 12 recollections card stock pack that had a sheet with these little rectangles that I cut apart. I mounted my finished piece on MFT Gold Shine then on SU Bermuda Bay. I hope you enjoyed my creations and I know you will love the rest of the Design Teams creations for you! Michele knocked this one out of the park! She is so talented! Check out the rest of the Hop show casing CAS-ual Fridays Release! Um...WOW! Really awesome projects and I'm so happy you had fun with the new collection. It shows in your work :) Hugs!